Scooba Public Library is open Tuesday & Thursday afternoons from 1:00 to 5:00. The library address is 801-1099 Kemper Street in Scooba, MS. The address is currently unavailable on Google Maps. For any further questions, please call 662-476-8454. You may also use the directions provided for further assistance. Call 662-476-8454 to speak to the Librarian in Scooba or 601-774-9297 to speak to the staff at Headquarters for directions or further assistance. 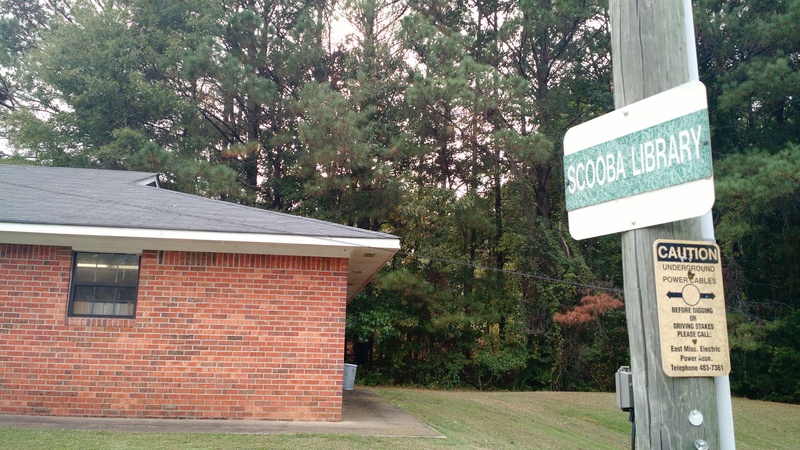 Scooba Library showing sign visible from the direction of the railroad tracks and Sanders Street in autumn 2015.